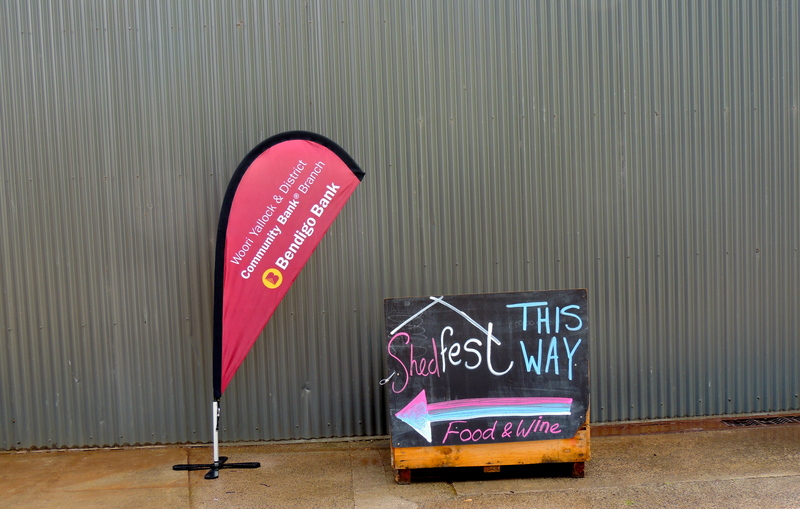 Shedfest 2013: SGS – These Two Eyes! My notes scribbled into my little green notebook look like chicken scratch. This is the result of another hard day of of wine tasting attending Shedfest, an annual wine festival held along the southern side of the Yarra Valley. You’ll need to keep reading if you want to understand the “SGS” reference to this blog title however the premise of Shedfest is you buy a glass for $10 and visit less then a dozen (eight to be exact) small wine makers for tastings in their shed, perhaps nibble on some local cuisine and listen to live music. Saturday was the type of day where you just could pull a blanket onto the grass, listen to music and sip wine in the sunshine. A perfect day for Shedfest. Sunday was the type of day to sit by the fire, escape from the rain, and eat hearty food and taste delicious wine. The other principle of Shedfest. We attended on Sunday. There were some notable highlights to the day however. We began the day at breakfast in Richmond to fill our stomachs before the hour or so journey east. As usual, I had the avocado smash. I was thankful to Brent for driving and we passed the time on our way into the country chatting about obscenities and saying mini prayers the rain would pass (or at least I secretly was). For the first stop of the day we were eager to get our tasting on. This stop coincided with the booze bus for those that didn’t have a chauffer such as we did so there was a bit of a backlog to get to the tasting. In the end, I favored the white cuvee (chardonnay dominant) over the black cuvee (pinot noir dominant) and was engrossed by the 2010 chardonnay, considering 2010 was the best vintage for the variety in the region. Although I learned a great deal from my host, such as the fact that wine labels only need to claim a blend if it contains more than 14% of another variety – which in turn means you can be tricked and aren’t always drinking just one grape when you think you are – he was very, very slow so I snatched up a bottle of the chardonnay and we were out of there. Before we go on, Seville is pronounced sev-el, not like the Spanish city. This estate contained one of the larger sheds and had about ten different wines offered for tasting. This was quite impressive and a treat to taste everything from sauvignon blanc to tempranillo. The set up of live jazz positioned against oak barrels piled high produced a warm aesthetic against the pouring rain outside however I found all of the wines easy drinking but frankly just average. So average in fact that we risked running to the car in the rain instead of sitting it out in order to move on to a vineyard where we’d be more inclined to buy a bottle to relax and share. The most picturesque property of the day, with cute little farm props positioned over the grounds, cows who posed for us out in the grass, a beautiful lookout over the valley and even a notable dog house for Dash. This was the type of vineyard you could envision a laid-back wedding being held at or just kicking back any day of the week. I’m not a big rose drinker, but I found the rose on tasting inoffensive. In fact, if you closed your eyes you wouldn’t even guess it was a rose on first taste. 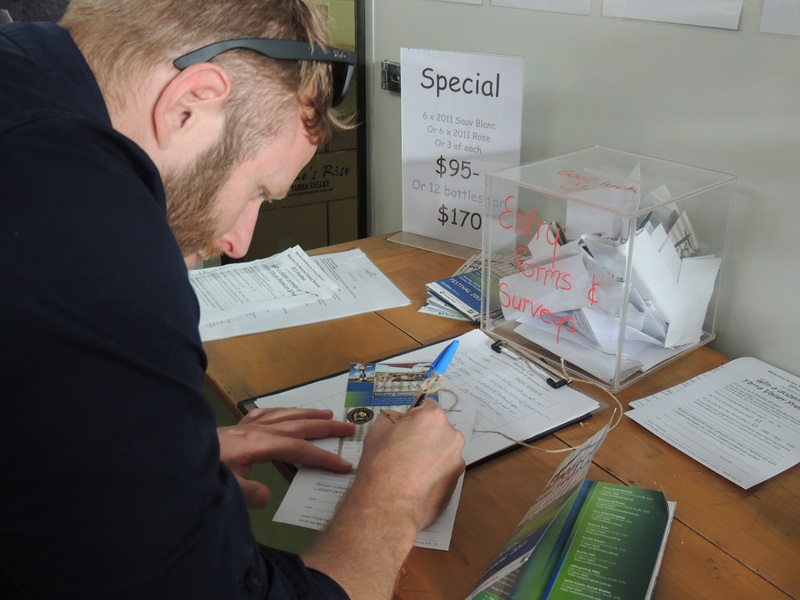 At this point we had collected a stamp from each winery for our Shedfest passports and turned them in to win the draw of a case of wine. Cross your fingers! We sought out this eclectic vineyard specifically for the pies advertised. As one would imagine by winery #4 we were getting fairly hungry. However, before we could divulge in our pies we made our way out to the paddock to greet a big mama cow so large she could have given birth right then, surrounded by a few other calves, either llamas or impalas (no one knew), a crazy sheep/goat thing and one fat chicken (aka chook). Their website claims, “our food shows passion for fresh, seasonal produce, sourced locally where possible.” I guess we know where our pies came from. And lastly we arrived at Five Oaks. I wouldn’t have asked for any better last stop of the day, specifically thanks to Wally. 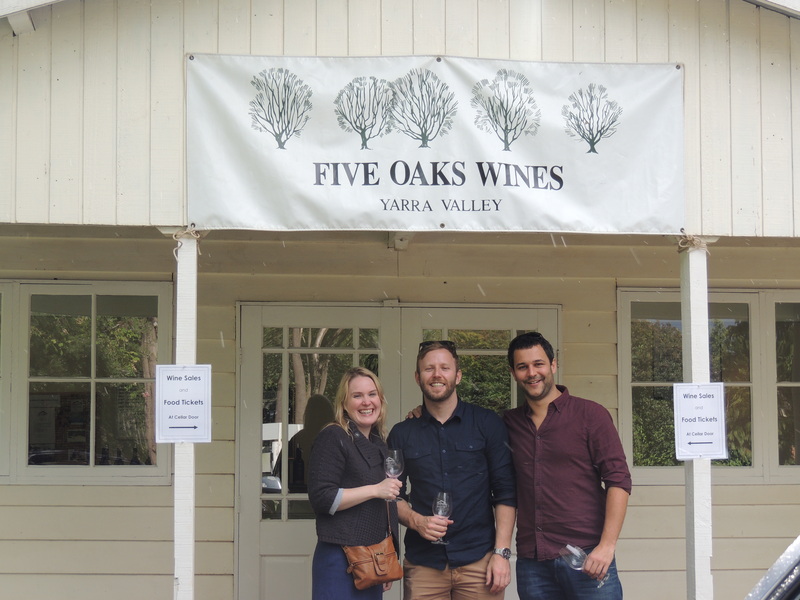 And so he settled on the Yarra Valley. Now, I would say the wine labels and winery itself could use some more character, but Wally and his good humored nature made up for it. In fact, as we tasted, Wally himself was sipping on what he likes to call “SGS”. 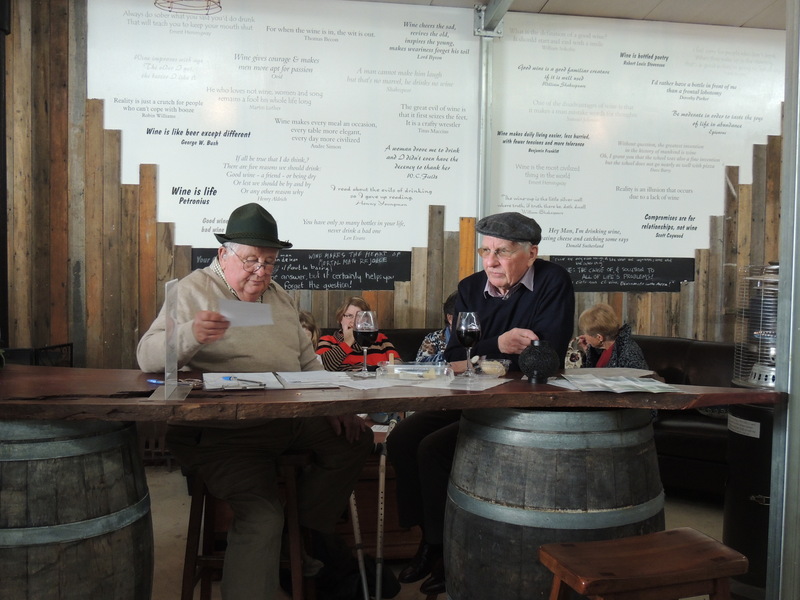 Once we finished the tastings and were about to go Wally offered us to try some SGS ourselves. Now, SGS is basically his reserve wine, however in a mock to Jacobs Creek who put ‘reserve’ on just about anything these days, Wally labeled all of his premium wines “SGS” otherwise known as ‘seriously good sh*t’. How could we all not buy a bottle after that story! These posts are seriously making me jealous!